Trigger Gap Outfitters - Trigger Gap Outfitters- Kings River is family owned and excels in customer service. Provides canoe, kayak, raft, SUP board rentals. Shuttle Services, camping, day use, swimming, and fishing. Canoes, Kayaks, Rafts, Fishing Kayaks, Stand Up Paddle Boards, Camping, Swimming, Shuttles and More! We are a family-owned outfitter located in Northwest Arkansas, on the ​Kings River. Our mission is to "provide a remarkable outdoor experience on the Kings River. We regard the river and environment with respect and will act as stewards to this resource. Together, we strive to achieve a safe, fun, educational, and memorable experience for our customers." Our 2019 season will begin on April 10th and will run through Labor Day weekend. We will be open Thursday- Monday from 8:00am to 6:00pm. We will be closed on Tuesday and Wednesday- or by reservation only. ​ We welcome you to come experience one of the five float trips that we have to offer, ranging from beginner level to the novice. We offer canoe, kayak, raft, and paddle board rentals and also provide shuttle services on the King's River. Camping is limited and our customers have priority to the sites we have. The Kings river is a magical river that flows north. The headwaters begin in the Boston Mountains, and it flows into Table Rock Lake. It is known for its wonderful water quality, small mouth bass ,fishing, meandering curves, deep pools, and sloping gravel beds. Many species of birds, fish, and wildlife can be observed while on the river. "Trigger Gap" is known by the locals, as a treasured and cherished swimming hole. Whitewater boaters come to enjoy Trigger Gap, when the water level is up. A whitewater wave "the gap" forms as a result of a portion of a previous low water bridge that the county took out. 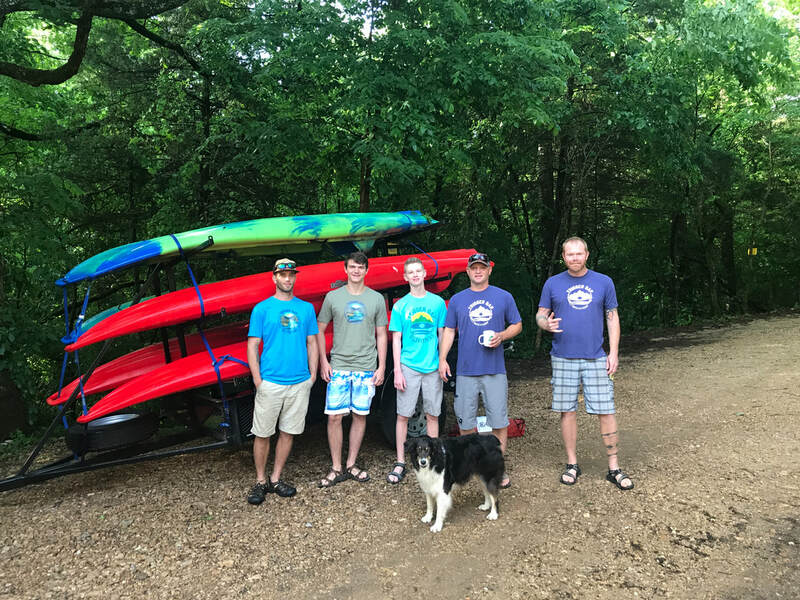 Whitewater Boaters are always welcome at Trigger Gap, free of charge, and we encourage you to come experience the wave.